A row broke out within minutes of the Oireachtas Committee on the Eighth Amendment commencing its first meeting since the mid-term break. It followed a decision by two pro-life witnesses to pull out from speaking to the group claiming it is a “kangaroo court”. 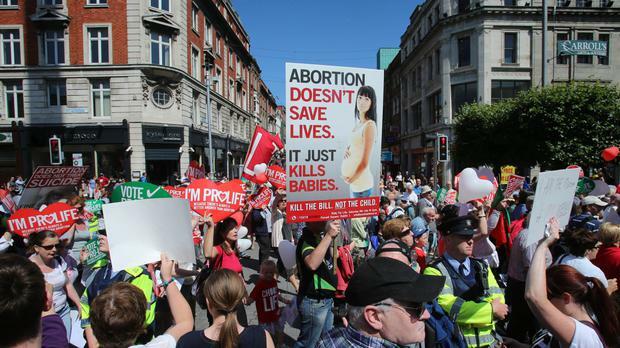 Professor of Pediatrics at the University of North Carolina, Martin J. McCaffrey and Dawn McAvoy from the pro-life group “Both Lives Matter” say the committee is “weighed” in favour of a recommendation to repeal the Eighth Amendment. They sent two lengthy letters to the chair of the committee Senator Catherine Noone, declining the invitation for them to give evidence and outlining their positions on abortion. Bernard Durkan TD criticised their decision saying he “doesn’t agree with abortion”, and wants to hear from “all sides” and called for the two witnesses to reconsider their decisions. A call was made by Mattie McGrath TD for their letters to be read in to the record but Senator Noone refused, saying it would be a “poor precedent” to read out such letters when the witnesses were invited to speak. Mr McGrath also said there was “bullying” by other committee members against those who are anti-abortion. Senator Paul Gavan accused Mr McGrath for “looking for an excuse to walk out”. Deputy McGrath has walked out of the committee and temporarily left the committee on a number of occasions since it started hearing evidence in September. In his letter to the committee, Mr McCaffrey says he initially welcomed the challenge to present “scientific, peer-reviewed and widely published best evidence on key topics for consideration". However, he decided to decline the invitation to speak after making the “startling discovery” that on October 18th the Oireachtas Committee had “already voted and determined” that they would repeal the Eighth. In fact, the Committee voted in favour to “not retain the Eight Amendment in full”. Mr McCaffrey also wished to make the point that so far no witness that has come before the committee “had yet spoken for the lives of unborn infants”. “There had been 25 pro-abortion speakers, at least six who were medical professionals”, he said in his letter.